The 2017 Masters takes place at Augusta National from April 6-9 and Paddy Power have launched the best betting offer on the tournament! Back 1 golfer to win the Masters and back another 4 for free!! Alongside theit 8 place each way offer, this is one of the most competitive offer on the US Masters ever! Back 1 golfer to win the Masters and back another 4 for free at PaddyPower The Masters is one of golf's most eagerly-awaited tournaments due to the excitement it generates every year at Augusta National. 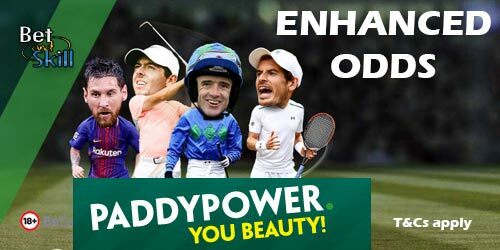 This year you can back 5 golfers at Paddy Power, paying only one bet! 2. Place your 1st bet of £5 or more on any Golfer to win the Masters outright 2017. 3. Receive 4x£5 free bets to be used on the Masters outright market only (£5 win or £2.50 each way). The free bet must be used before the Masters ends. Deposit and place a £5 or more bet on any Golfer to win the Masters outright 2017. Customers using Moneybookers or Neteller to deposit will not qualify for this free bet offer. Qualifying bet must be placed on the Masters outright market only ( £5 win or £2.50 each way). Receive four free £5 bets to be used on the Masters outright market only ( £5 win or £2.50 each way). The free bet must be used before the Masters ends. Free bets expire at 23:59 on April 9th. "Back 1 golfer to win the Masters and back another 4 for free at PaddyPower!"